Welcome to our buying guide to help you decide on the best travel trailer generator when you’re out on the road. When it comes to choosing the right generator, it’s important to know what electrical equipment you want to power at the same time. Most people try to save money and get a smaller generator but if you want to run an air conditioner then you should aim to get a generator with at least 3000 starting watts. We cover a lot of topics in this article and we review several of the best travel generators your money can buy. A travel trailer gives you the freedom to vacation anywhere you want. This allows you to take your family off the beaten track and experience the true greatness of the outdoors. As great as it is, you can end up in campsites where there is no access to an electrical supply. What you need then is a reliable travel trailer generator. If you choose the best generator for your trailer, you have the added advantage of owning an emergency backup power supply for your home when there’s an outage. Buying a generator is a big decision, they’re not cheap. Making the best decision today, will ensure that you have a quality generator for years to come. Whether it’s for a travel trailer, RV, home, or business, a dependable generator is a worthy investment. This article is going to help you choose the best travel trailer generator that can also serve the purpose of providing power to your home or anywhere else you may want to use it. We’ll be reviewing some great generators and then move on to provide a lot of useful information. My aim is to help you understand generators, concentrating on the specific requirements of the trailer owner who wants to use the generator in a campsite. Quiet generators. This of particular importance if you’re buying a generator for your travel trailer. A noisy generator in a campsite is going to be a problem. This is also the case when using a generator for your home and you’re likely to be using it for both purposes. Fuel consumption and operating costs, affect your budget for years after you’ve bought the generator. So as I review the various generators, I’ll pay attention to how much fuel it uses. You’ll get a better picture of what your long-term costs will be. This can be more important than the initial purchase price of the actual generator. Apart from the actual fuel consumption, the type of fuel that you can use will be important. Some people prefer a dual fuel (hybrid) generator and I’ll go into this too. There’s a lot of talk about inverter generators, these days. I’ll help you better understand the pros and cons of this technology. For most trailer and homeowners, there are a lot of advantages to using an inverter generator. Durability and general quality is of utmost importance. When you’re spending good money on a generator for your travel trailer, you want to know it’s going last and be reliable. One also needs to look at value for money. If you’re not going to be using your generator too much or be working it too hard, you may not want to pay for a really heavy-duty machine. Before making your decision, you’ll need to determine how much power you need from your generator. If you use an air conditioner to cool your trailer, this can be an important decision. Air conditioners need more power than most appliances and require even more when starting. I explain all of this in the article. These are some of the topics I’ll be addressing. So, by the time you’ve read the entire article, you can be sure you’ll know what you’re in for when buying a travel trailer generator. There’s a lot to cover and I’ll start by reviewing your best options for a portable generator that’s going to be the ideal power supply for your trailer, RV, or home. Ultra-quiet (59 dB) dual-fuel inverter generator. Runs on either gas or propane. Gas = 3400 starting watts / 3100 running watts — and will run for 7.5 hours at 25% load. Best travel trailer generator, with plenty of options and enough power for most people. Highly recommended! The perfect inverter generator for life on the road. What I like most about Champion Power Equipment products is their price vs quality and usability. I’ll never claim that the Champion 100263 is in the same class as similar generators from Yamaha and Honda. But for its price, this is a remarkable generator. If you’re using this generator for an annual vacation and the occasional power outage, it’s not going to disappoint you. The Champion 100263 has the full house in terms of specs and features. It has dual fuel capabilities. So you can run the generator using either gas or propane. If you’re not sure if this is really worth it, I’ll discuss dual fuel generators after reviewing the products. One of the things about propane is that you don’t get quite the same power from your generator as when you’re using gasoline. When running on gas, the Champion 100263 produces 3400W of starting power and 3100W of constant running power. On propane, this drops to 3060 starting watts and 2790 running watts. This means that, when running on gas, the Champion will be able to start and run a 13,500 BTU AC, but then the generator is at its peak. So you can’t really use anything else. You can forget about an air conditioner of this size, when running on propane and, regardless of the fuel, you can also forget about a 15,000 BTU AC. Though before you write this generator off as not being capable of running an air conditioner, take into account that this is an inverter generator with parallel connection ports. This means that you can double your output by connecting two generators in parallel. I know it means buying two generators instead of one larger unit which will cost more and you have to buy an additional parallel kit, but parallel connectivity has its advantages. I’ll discuss this in more detail later when we take a detailed look at inverter generators. Other advantages to using this inverter generator is the clean power that it supplies, suitable for sensitive electronics and an economy mode that reduces your fuel consumption and noise levels. As far noise goes, the Champion is great. Apart from the quieter low engine revs that reduce the noise, it also has excellent acoustic insulation panels that enclose the generator. The specified noise level is 59dBA from 23-feet away – this isn’t even as loud as a normal conversation. Fuel consumption really isn’t the best and this would be the only real issue with the champion. The 192cc, 4-stroke engine is both EPA and Carb certified, so it’s a winner in terms of low emission levels too. It has a 1.6-gallon gas tank and this will keep the generator running for 7.5-hours at 25% load, which works out at 3.6 kilowatt-hours per gallon. There are quite a few inverter generators that offer better fuel consumption, but this is still better than many conventional generators. On propane, your fuel consumption is never as good as with gas. But because propane is compressed, you get more runtime for the same volume of fuel. Meaning that the Champion will give you 14.5-hours of runtime at 25% load from 20-pound propane tank. This is a very user friendly generator. It has both electric and recoil starters. This obviously means that it needs a battery which pushes up the weight slightly. Low weight is quite important on a travel trailer generator, because you’re probably going to be lugging it about quite a lot. Though even with the battery, the Champion weighs only 95.7 LBS. This isn’t too bad and it has very convenient handles that run the width of the machine – both at the back and front. These handles offer an excellent center of gravity that make it much easier to lift and carry. It also has wheels, though these are certainly not heavy-duty. I wouldn’t recommend using the wheels on rough terrain. The control panel makes life really easy. There’s no volt meter or any complicated gauges and displays. Instead, you get everything you need in an easy to use layout. It has two 120V 20A standard household outlets and a 30A RV outlet. These are protected by circuit breakers. The parallel kit (sold separately) has a 50A RV outlet because you have twice the power output when connecting two generators in this way. It also has a 12V battery charging outlet with an automotive (cigarette lighter) style outlet. An impressive little generator. Designed for making your life easier. I’ll conclude by saying that the Champion 100263 is excellent value for money. It’s a top grade inverter generator, with all the specs I’d want to see and it costs a lot less than its closest rivals. While the fuel consumption is by no means great, it’s still reasonable. Though your fuel costs are going to eat into the savings benefit of the purchase price. With a 3-year warranty, you can be assured that this is a quality product. In the end, you’re getting a really good deal. It’s going to take many hours of run-time before your gas costs outweigh the fantastic price that you’re paying. So for a relatively cheap generator, you’re getting one of the best and it’s perfect for a travel trailer. If you want to power your travel trailer air conditioner you’ll have to run two Honda EU2200i’s in parallel. This is an excellent quiet generator but it’s not cheap. Running two in parallel gives you a flexible power system that won’t let you down when you need it most. **This generator has been recalled as of Mar 20, 2019. Read our dedicated article to the recall of the Honda EU2200i. 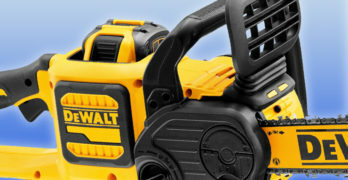 For now, we recommend you stay away from buying this generator until the recall is over and the problem has been fixed. Consider the Yamaha EF2000iSv2 or the Yamaha EF2200iS (New for 2019), which are equally as good. Read the official recall on the CPSC (Consumer Product Safety Commission) site. Note : The links to this generator have been removed as it’s currently not for sale on the Amazon site. We’ll update the links when this problem has been rectified. Beware of buying old stock. Don’t buy until the recall is over and you know you are buying new stock. EU2200i delivers 10% more power than the EU2000 – enabling you to power more of what you need, in the same lightweight, compact package. Whether it’s an extra refrigerator at home, a larger saw on your construction site, a larger TV at your tailgate party, the EU2200i gives you the power to get more done. I’m one of the first to state that Honda generators are some of the best. While they cost more than many, a Honda is about as reliable and robust as they get. Even though the EU inverter series are not the industrial-grade machines that you get when buying an open frame Honda, these are incredible generators. If you’re counting pennies, the Honda EU2200i, may not be what you’re looking for. It cots quite a bit more than the Champion 100263 is not nearly as powerful. Though I’m not alone in the view that Honda generators are worth paying top dollar for. They simply don’t break and outlast almost any other. If this is type of thinking that works for you, then the Honda is likely to be your number one choice. The Honda EU2200i provides 2200W peak power and 1800 continuous running watts. This leaves you somewhat limited as to what you can run on the generator. Not much more than a small refrigerator or microwave and few light appliances. Fortunately, the Honda is also an inverter generator and allows for parallel kit that will enable you to use two generators together. By doubling your power, you’ll have 4400W peak and 3600W continuous power. Even then, you’ll just be able to squeeze enough out of the generator to power a 15,000 BTU air conditioner but you won’t have much to spare for any other appliances. If you’re using a 13,500 BTU AC, you’ll have a bit more to work with. Though this would not be my first recommendation for a generator to supply an air conditioner. Honda make larger inverter generators. While a larger model will obviously cost more than the small EU2200i, you will have more usable power. The ideal setup for your travel trailer or RV. The Honda EU2200i is powered by their legendary GXR120 engine. This 121cc engine is one of the most reliable ever built and very fuel efficient. Unlike the dual fuel Champion the Honda will only run on gasoline. If we’re looking at the fuel consumption, the Honda will provide 8.1 hours of runtime from the tiny 0.95-gallon gas tank. This calculates to 3.84 kilowatt-hours per gallon. This is a little better than the Champion and, when you consider that the Honda is going to last for many years, you’re going to be saving on the fuel costs over the lifetime of the generator. After about 10-years of use, those extra dollars that you spent on the Honda will begin to make sense. This is a refreshingly quiet portable generator – a big plus when using a travel trailer in a busy campsite. With generator in economy mode, the noise level will be as low as 48dBA, climbing to about 57dBA when the engine is running at high revs. As a camping generator, the very low weight and compact design makes the Honda EU2200i the perfect choice. It weighs a mere 46.5 LBS. Most adults will be able to carry this generator using only one hand. The easy grip handle means that you can carry it like a suitcase. It will fit easily into the trunk of any car, making it very handy travel companion. As quiet as a normal conversation. It doesn’t have an electric starter. But the recoil starter is really smooth and easy to use. The GXR120 engine starts every time with very little effort, so the lack of electric starting will go by unnoticed. The fact that it doesn’t a battery contributes to the Honda’s exceptionally low weight. It has very convenient outlets on the front panel of the generator. There’s choice between having 2 X 125V 15A household outlets and a 12V DC outlet or you can have 1 X 15A household outlet and a 30A 125V twist lock RV outlet. If you’re using two in parallel, it’s a good idea to buy one with two household and the DC outlet and another with the 30A RV outlet. You only need the 30A outlet when the power is doubled. A single EU2200i only provides a maximum of 18.3A. Control panel. Straightforward and easy to use. When you’re looking at your dollar per watt, many would prefer the Champion 100263 over the Honda EU2200i. Though if you’re thinking long term, the Honda would make better sense. It uses a little less fuel and Honda products are known to last and last. Their 3-year warranty is excellent and so is their service. You can’t go wrong with Honda generator and, for this, you’ll be paying extra. Everything you need in a compact inverter generator — quiet, powerful, and fuel efficient. One of the best travel trailer and RV generators you can buy. I love the fact you get an extra 500 watts of power for starting those demanding electrical devices. Features Yamaha Boost Technology : Provides a power boost on demand. 50 state legal — Meets emission regulations. CARB compliant. Yamaha is another premier power equipment manufacturer. This makes them among the more expensive generators, very much in the same league as Honda. Though Yamaha has the edge on all the others in that they make use of more advanced electronic technology. This makes the Yamaha EF3000iSEB the smartest inverter generator you can get. Apart from cutting edge modern technology, the Yamaha has a good deal of old-fashioned engineering that ensures a quality product that’s going to work efficiently for a very long time. This generator has a party trick that is not just for show, it’s very useful. The Yamaha EF3000iSEB has a rated power output (running watts) of 2800W and a peak power of 3000W. This is a reasonable amount of power for a generator of this size. But where the Yamaha shows its superiority is in the way that they make use of the inverter. Apart from the normal running and peak watts, like you’d get from any generator, the Yamaha has an extra boost power. It can exceed its peak power output by 500W for 10-seconds. When needed, the inverter will use the internal battery to produce the extra boost of power. So the Yamaha will give you up to 3500W for a period of 10-seconds. Because this power is produced by a sophisticated low HD inverter, the voltage remains stable at all times – even when pushed to its maximum 3500W. I don’t know of any other generator that has this capability. Though it’s not all good news. Despite the very clever inverter with its boost power, this generator doesn’t have parallel connection ports like most other inverter generators. You can’t use two generators together. Having up to 3500W is great for most air conditioners, but might leave some lacking. Because the boost power comes from the battery, not the engine, you’re getting an astounding amount of wattage from a relatively small, fuel-efficient engine. The only problem is that you can’t go higher than the maximum power rating. If you’re able to connect two generators in parallel, you have the option to double your output. The Yamaha has a fantastic 171cc, 4-stroke engine. If we compare this to the 192cc engine used to power the Champion 100263, the Yamaha is a clear winner. The champion produces a peak power of 3400W, whereas the Yamaha can boost the power up to 3500W. That’s 100W more from a smaller engine. So how does this translate into your actual fuel consumption? At 25% load, the Yamaha can run for 18.6-hours. It has a 3.4-gallon gas tank which means that you’re getting 3.83 kilowatt-hours per gallon. That’s very close to the Honda which has a much smaller 121cc engine. A generator with a higher peak wattage will use a bigger engine which, in turn, uses more fuel. This is the case even when there is no load on the generator and it’s running on idle. In this context, the Yamaha EF3000iSEB is incredibly fuel-efficient. This engine is also EPA and CARB certified so it has emission levels that are low enough for it to be sold in all 50 states. The noise levels are also very impressive. Even though this generator doesn’t quite match the low noise of the Honda, it is almost as quiet. When the power output is low and the generator is switched to eco-mode (Smart Throttle), the noise level is 53dBA. Even when using all the power from the engine, it isn’t disruptively loud with a noise level of 60-dBA. The user functions are easy to follow and logical. The Yamaha has both electric and recoil starters. It also utilizes automatic decompression on the engine when starting, so it takes virtually no effort to pull-start the engine. It has two standard household 120V outlets and a twist lock 30A outlet. A 12V battery charging outlet is also provided. The wheels are small, but have metal rims – so they’re tougher than most. It has four wheels, the front being swivel caster type wheels for extra maneuverability. It also has a parking brake. It’s quite a heavy brute – 154.3 LBS. Yamaha provide a huge selection of optional extras for the EF3000iSEB. These include a tachometer/hour meter that helps you manage your service intervals and a load meter, this allows you to accurately determine how much power you’re using at any given time. Watch this short video to hear how quiet the EF3000iSEB is. The Yamaha EF3000iSEB is an expensive generator and I suppose this means that it’s not for everyone. Though for people who want the best inverter technology used in a portable generator, this machine has a distinctive wow factor. Combine this with the Yamaha reputation for building exceptional machinery and a 3-year warranty, the price becomes even more justifiable. Truly, probably the absolute best travel trailer inverter generator you can buy. Enough power to run most 13,500 BTU air conditioners. Professional-grade quality. 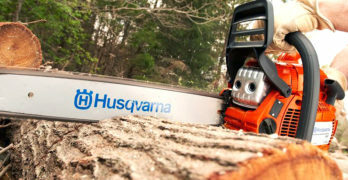 Look, for most people this is too expensive but if you want the best then Honda generators can’t be beat — although Yamaha is pretty darn close. Quality generators cost money. Note : I highly recommend the All Terrain Wheel Kit for the Honda EU3000iS. Trust me, this generator weighs 131 lbs., you don’t want to be lifting it around. I don’t understand why Honda doesn’t integrate wheels into this generator. It makes no sense. Yamaha is far more generous with their Yamaha EF3000iSEB model as it has 4 wheels as part of the design, which for the price of these generators it’s silly not to include wheels. Sorry Honda, consumers deserve better. The Honda EU3000iS is a worthy rival to the Yamaha EF3000iSEB. It doesn’t have the extra 500W boost power, but has quite a few redeeming features that may make it more attractive to many generator buyers. These two generators are very similar in price and are equally matched in terms of high-quality build and design. The GSX200, 196cc engine is, as to be expected, a remarkable and virtually indestructible unit. Honda are famous for this. This gives you 2800W running power and 3000W of peak power. While this model can’t compete with the Yamaha when it comes to maximum power output. It’s a winner on every other level. For one thing, the Honda EU3000iS has the ability to double its output, thanks to the parallel connectivity. So you can end up with 6000W peak power which is almost unlimited for use with a travel trailer and much more convenient for home use when more watts are needed. It’s also quieter and you get better runtime from a tank of gas. 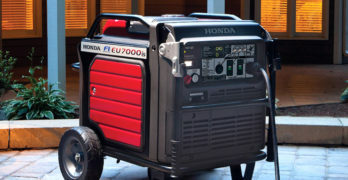 In fact, the Honda EU3000iS is the most fuel efficient of all the generators that we’ve reviewed so far. This is remarkable because it has the largest engine. You’ll get an incredible 20-hours from the 3.4-gallon gas tank at 25% load – 4.12 kilowatt-hours per gallon. Another amazing spec is the fantastically quiet operation which ranges between 50dBA and 57dBA. It weighs 131LBS. This really isn’t too heavy for a robust generator of this size, but it doesn’t have wheels so you’ll need to lift that weight every time you move the generator. As one would expect, this is a very user-friendly generator. It has an electric starter with a backup recoil starter. You’ll also get the usual 2 X 120V household outlets, a 30A twist lock RV outlet and a 12V battery charging outlet. Naturally, all circuits have overload protection. It has a wonderfully compact design and the metal sound-insulating cover is more robust than the usual plastic used on most quiet inverter generators. As much as I’m in awe of the clever power boost technology adopted by Yamaha, I feel that the Honda EU3000iS is the superior generator in this class. If you need more power, you can use a second generator. This is going to double your cost, but you end up with good deal more usable power and the versatility to choose whether you want to use one or two generators. The Honda trumps the Yamaha in being lighter, quieter and more fuel efficient. The fuel savings when using the Honda are quite significant and you will certainly notice this during daily use. The Honda EU3000iS is also one of the few generators that offer a 3-year warranty for both residential and commercial use. Most generator manufacturers don’t provide such a generous warranty for commercial use and this indicates to me that Honda are confident of the industrial-grade quality that this generator offers. Champion generators are quite impressive in their own right because they are high-quality and yet still very affordable for homeowners. It’s a nod to their engineering team that they can create such great products while keeping costs down. The Champion 75537i is one of the best inverter generators for the money, whether it’s for your travel trailer, RV, workshop or simply backup power in case of a power outage. This is a great generator at a great price. Included wireless remote key fob can start the generator up to 80 feet away. Electric start includes a battery. With Cold Start Technology to ensure it starts in cold weather. Quick Touch Panel. Push-to-reset circuit breakers. Produces Clean Power (less than 3% THD). Can safely power all of your sensitive electronics. Oil capacity = .6-quart (recommended 10W-30). Outlets : 120V 30A RV (TT-30R), two 120V 20A household outlets (5-20R) plus a 12V DC automotive-style outlet with a dual USB adapter and 12-volt DC battery-charging cables. 8 hours of run time at 25% load when the 1.6-gallon tank of gasoline is full. From 23 feet, this inverter operates at 58 dBA – about the same noise level as normal conversation. Smart Economy Mode, reduces the electrical load, providing quieter operation, extended engine life and better fuel economy. Fully assembled with hassle-free set up. Foldaway U-shaped handle makes it easy to store. Built-in carrying handles and never-flat tires. EPA certified and CARB compliant inverter. Champion Support and their nationwide network of service centers will back up your purchase with a 3-year limited warranty and FREE lifetime technical support. ✓ View or download the MANUAL for the Champion 75537i. Includes : Oil Funnel, Spark Plug Tool, Battery Charging Cables, Remote Key Fob, USB Adapter. While I hold both the Yamaha EF3000iSEB and the Honda EU3000iS with the highest regard, they’re pricey. The majority of people might not see much sense in paying this much for travel trailer generator that isn’t going to be used on a regular basis. For these guys, the Champion 75537i provides a very reasonable alternative. It may not be up to the hardworking conditions that the two Japanese inverter generators are built for, but it does the job and is reliable. You may have higher maintenance costs as the Champion gets older, that will depend very much on how you look after it. But, in the end, it costs a lot less and is by no means junk. On the contrary, the Champion 75537i offers amazing value for money and is packed with user-friendly extras. With a peak wattage of 3100W and constant power of 2800W, it’s every bit as powerful as the previous two generators in this review. The 171cc, 4-stroke engine is reliable and starts really easily by means of either an electric or recoil starter. You have the added advantage of a remote control which allows you to switch the generator on or off from up to 80-feet away. This is very convenient at night, early mornings, or in adverse weather. Something that has concerned some users is that the generator does not connect the power supply until 15-seconds after starting the engine. This has led some people to believe that the remote doesn’t actually switch the power on. However, this time delay is necessary to protect the generator and your appliances. 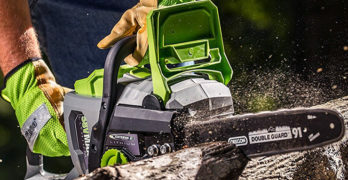 It allows the engine to get up to speed and supply a stable electric current before connecting the power outlets for use. The Champion 75537i is both CARB and EPA certified, emission levels compare to the best of them. Fuel consumption is great, but the gas tank is small (1.6-gallons). So while you’re getting a very reasonable 3.5 kilowatt-hours per gallon, your runtime at 25% load is only 8-hours. With a noise level of 58dBA, the Champion is about as quiet as any of the best silent inverter generators. Like the others, the low HD inverter supplies perfectly clean power for your electronic equipment. It also has the same economy mode that lowers the RPM when you’re not using much electricity – saving fuel and reducing noise levels. Power outlets are as convenient and comprehensive as the others: 2 X 120V household outlets, a 30A twist lock RV outlet and a 12V DC outlet. You also get battery charging cables and a USB adapter for the 12V outlet. In line with modern standards, all the circuits are protected by circuit breakers. While the sound-dampening plastic enclosure looks fairly robust, I would handle the Champion with a degree of care. It’s not going stand up to as much abuse as the tough Honda or even the Yamaha. I’ll say the same for the wheels. They’re okay for a flat paved surface, but are in no way suitable for rough terrain. It has a fold-down U-shaped handle which makes it easy to move and isn’t at all that heavy for this class of generator – 96.6 LBS. Though this lower weight is an indication that it’s not as robust as the heavier machines. I wouldn’t call the Champion a delicate generator, it’s just not as tough as the more industrial machines. Treat it with respect, and you’ll get many years of faithful service from this generator. It’s powerful enough for most trailer or RV owners and is very convenient to use. The wireless remote control is great feature and is something that is quite rare. In tinrms of service and technical support, the guys at Champion are not lacking in any way. You’ll get the same 3-year warranty as with many of the best generator brands. In a nutshell, you’re getting a lot for your money. 3000W inverter generator. Excellent travel trailer and RV generator capable of running a standard air conditioner. At 59 dB operating volume, it’s quieter than a normal conversation, so it blends into the background of social situations. reduces smoother power for sensitive electronics such as laptops, phones and gaming systems. Easy-to-read LCD screen shows the amount of power being used, total unit hours and maintenance reminders including oil. air filter and spark plug changes. We all have a different idea as to what are essential appliances to be used when vacationing in a trailer or RV. When it comes down to it, you need to match your expectations to your budget. Buying a really cheap generator is not going to be worth it. Of the models reviewed here, we’ve looked at the best of the best, in the form of the Honda and Yamaha models. While the Champion alternatives are a good deal cheaper, they’re not scraping the barrel of the bargain basement. All these generators are good machines. 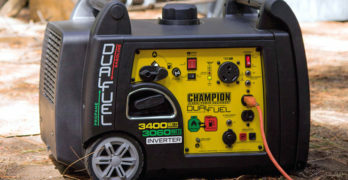 So while the more expensive generators are of the highest quality standard, the Champion generators are the best in their price range – I wouldn’t recommend going any cheaper for the same size generator. So it’s important to stick to good brand, you know what type of quality you’re getting. Though even then, you’ll be paying more for a larger generator. This is where you need to consider your needs very carefully. You can choose to save money by buying a smaller generator, but this is going to mean a compromise on your part. You won’t have the same amount of power for your appliances. How many watts do you need for travel trailer generator? Every generator has two power specs – running watts, or constant power, and peak watts, or starting power. It’s important to list your appliances and look at how much power they require to start and how much they use on a constant basis once they’re running. Your generator’s peak power output is only for short period, this is to allow high startup equipment like air conditioners and refrigerators to function. They need a high burst of power to start. Your lights, TV, and computers are not going to play a major role. Usually the combined requirements for all of these appliances won’t be much more 500W-600W, perhaps less. These low powered devices also don’t require any startup current. A refrigerator and microwave are going to be the next biggest item on your list. A large refrigerator will use about 800W to run and will need around 1200W-1600W to start. A microwave can be anything from 600W-1200W, depending on the size. A small travel trailer might have an under counter refrigerator and this might use a 12V power supply from a battery. This is a good way to go. A 12V refrigerator won’t add any load to your generator and it’s easy to charge the battery using the generator. This won’t require much power. Things escalate quite dramatically when start to look at air conditioners. So let’s take a better look at the power requirements for the type of air conditioner that you’d typically be using for an RV or travel trailer. What size generator do you need for a trailer air conditioner? The question could be: are going to match your air conditioner to your generator or the other way around? If you can, try use an energy star air conditioner, they use a lot less electricity. But, chances are, your trailer already has an AC and you want to make sure that your generator is going to work with your existing air conditioner. If you’re looking at small standalone air conditioners, things aren’t too bad. A small portable air conditioner can draw as little as 500W on a constant basis and will require about 1100W to start. When we move on to typical RV air conditioners that you’re likely to be using in your trailer, you’ll need to consider your generator more seriously. For a 7,000 BTU RV/trailer air conditioner, you’ll need 600 running watts and 1700-watts of starting power. For a 10,000 BTU RV/trailer air conditioner: 700W (running power); 2000W (startup). For a 13,500 BTU RV/trailer air conditioner: 1250W (running power; 2750W (startup). For a 15,000 BTU RV/trailer air conditioner: 1500W (running power); 3500W (startup). Energy Star air conditioners can reduce your power consumption by up to 40%, so they’re worth looking into. You can get away with a much smaller generator and you’ll be saving on gas. So, even though these air conditioners cost more, you’ll save a lot on the price of your generator and the gas that you’ll be using. If you’re matching your generator purely for you AC, you may decide that a peak power output of 3500W is fine for a 15,000 BTU air conditioner. When the AC isn’t starting, you will have sufficient peak watts from your generator. The air conditioner is drawing 1500W on a constant basis and you should have over 2500W constant power available from your generator. In theory, this might work. But your AC cycles all the time, so it can start or stop at any time. The thermostat determines when the compressor needs to start. So there’s no telling when your generator will need its peak power and if you have any other appliance drawing power at this time, the generator will trip. So I wouldn’t recommend buying a generator that is just capable of starting your AC. If you do this, you’ll need to switch the air conditioner off or switch it to fan only, every time you want to use electricity for anything else. While this is possible, it’s a hassle and certainly not ideal. With a small generator, you’ll need to be aware of power usage as you only have a limited amount of watts at your disposal. This is why a 12V circuit is a great advantage in a travel trailer. I mentioned a 12V refrigerator, but there are all sorts of 12V electric appliances that have been designed specifically for camping. These will only require a deep cycle battery that can be charged at any time. Do you actually need an inverter generator? An inverter generator is going to cost more than a conventional one. You may not see the need to spend this extra cash for the same amount of watts. Before you decide, it’s probably better to understand how an inverter works and why it can be important. Modern appliances rely heavily on electronic circuitry to function. This includes just about every piece of electric equipment that we use, from washing machines, microwaves and air conditioners to TVs, computers and stereos. Any electronic circuit is damaged by harmonic distortion (HD). HD results from fluctuations in the voltage and frequency of the electric current. The basic principle of a generator hasn’t changed much in over a hundred years. It converts mechanical energy into electric energy. So a portable generator uses an engine (mechanical energy) and converts this into an electric current by means of an alternator. In order for the electric current to remain stable, the alternator has run at a constant speed. As the load increases, the force on the alternator increase and this causes it slow down. In order to meet this demand, the engine has to speed up. So the engine is constantly adjusting the throttle position to do this. There’s always a delay between the increase in electric current and the throttle movement. This causes the voltage and/or frequency to fluctuate for a short period, causing an imperfect sine wave known as harmonic distortion. Because of the increased use of electronics, inverter generators have become more common. When we look at smaller generators (under 5KW), the need for an inverter becomes more important. This is because HD is relative to the percentage difference in the demand vs the alternator’s capacity. In other words, if we increase the load of a 2KW generator by 1KW, we’re increasing the demand by 50% of the total capacity. If we increase a 10KW generator by the same wattage, our increase is only 10% of the total capacity. The HD of the 2KW generator will, therefore, be much higher. A small portable generator is very handy for camping because it’s easy to transport. But this means they won’t have a high capacity and your risk of HD is greater. For this reason, an inverter becomes quite essential when buying a small travel trailer generator. Without it, your appliances will be damaged over time. Besides the low HD clean power that an inverter provides, there are a number of other advantages that make inverter generators a great solution for trailers. The economy or smart throttle switch that you’ll find on just about any inverter generator is a big plus. Because the power is controlled by an inverter, the engine speed can be reduced when you’re not using a lot of electricity. It’s likely that you’ll be spending long periods using only a small percentage of the generator’s total capacity. Having the engine running at full revs for all this time is an outright waste of fuel. Another advantage is that a lower RPM means less noise and, in a campsite, generator noise is a big concern. The inclusion of parallel connection on many inverter generators is yet another big advantage. Not everyone is aware of how handy this can be. You may think it’s better to buy a larger generator. Why waste money on two small generators and pay for a parallel kit on top of this? Firstly, the price difference between two small generators and one large one isn’t always too much and the benefits can outweigh this price difference. It’s mostly about the versatility. You don’t always need a large generator. So why lug a huge, heavy machine around when it’s not necessary. Not to mention that that the large generator uses more fuel. So a small generator is great for tailgating and short camping trips when don’t really need all that much electricity. When there’s an outage and you want to supply emergency power to your home, you’ll want more power and portability isn’t such a big concern. This is when it will be great to have the second generator to meet these needs. Using propane to power a generator came about mostly because of environmental concerns. Propane burns cleaner than gas and, as a result, releases lower amounts of harmful emissions into the atmosphere. This clean burning aspect also means that there’s a lower carbon build-up in your engine and carburetor, resulting in less maintenance. There is, however, a drawback to using propane. Your engine doesn’t produce the same power as it does when running on gasoline. So your output wattage from your generator is about 10% lower when using propane. Generally, this won’t affect you too much and there a number of practical advantages to using propane. What I like most about propane is the way in which it is stored. Gas cans can leak and they always release fumes. This is both unpleasant and can be dangerous. Propane tanks are completely sealed – they cannot leak and there are no dangerous fumes. Another great safety aspect to using propane is that the tank connects directly to your generator. There’s no chance of spillage which happens very easily when transferring gas from the container to you generator’s gas tank. Propane is not only safer and more convenient to store and transport, it’s also much more compact. Because the propane inside the tank is compressed, a small 20 LBS propane tank is usually going to provide you with more than twice the runtime that you’d get from a 1-gallon gas can. The option of using more than fuel source ensures better availability. This can be a big factor in times of natural disaster. During the hurricane season, heavy snow storms, or earthquakes, the supply of gas can be disrupted. Demand increases because everyone fills up their cars and they stock up on extra gas for their generators and other uses. Damage to infrastructure may prevent supply vehicles from reaching the gas stations. Without replenished supplies, the gas stations can easily run dry. If you’re able to use propane instead, this is obviously going to help.